Inman is interviewing real estate professionals in every area of the field to talk about technology use. Here’s Rachael Hite, a business development specialist with Finance of America Mortgage Winchester and an Inman contributor. 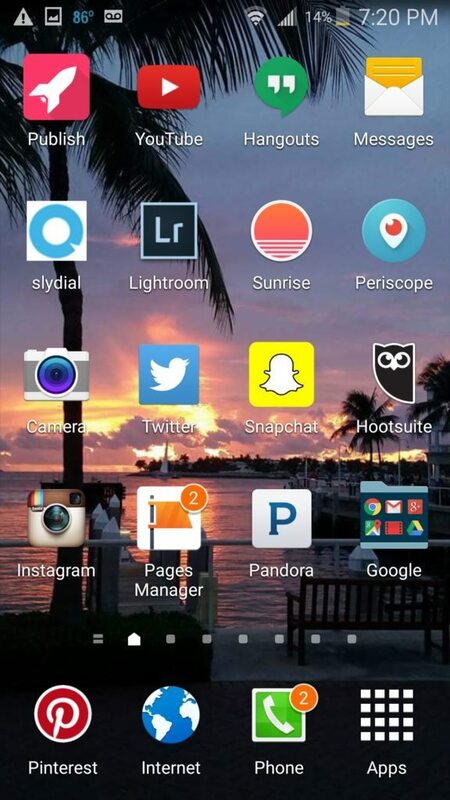 I have been an Android fan girl for a long time; I’m currently using the Samsung Galaxy S5. I primarily use Google products for almost everything. That being said, lately I have had “Apple envy” because the best new apps seem to be Apple first … Android later. YouTube is my favorite learning tool. I have self-taught myself so many things, from video editing to fixing my washing machine! I would say about 60 percent of my day I’m online working. I’m flexible. I can work just as easily from my phone as I can from my Chromebook. For serious graphic and video work, I prefer to work on my iMac. I have a Chromebook (my preferred writing tool), a Samsung Tablet 10.2 and my phone. My iMac is great for editing photos and video, and then I have a standard Dell PC laptop that I use for training and presentations. I LOVE, LOVE, LOVE my job. It is unique because I get to wear many hats. I’m Hootsuite-certified in social media, and I teach real estate licensing classes about proper use of social media. Technology supports everything I do. I offer one-on-one training with agents to help them remedy specific issues they are having. The bulk of what I do is create quality content and original marketing for real estate. I’m very blessed that I have had mentors and supporters who have helped me turn my passion into a full-time career. I love new tech. When I find something wonderful and new, I cheer out loud. I try to channel that enthusiasm into my teaching and training. Many agents I work with have been defeated, confused or overwhelmed by technology. My personal mission is to help them find tech that works for their skill level and give them the confidence they need to enjoy it and succeed in their business. Combating “tech fatigue,” as I like to call it. Agents are overwhelmed and frustrated with the pace of technology. Tech is often not user-friendly for what agents are trying to accomplish. Rapid evolution of tech has spurred “FOMO” (fear of missing 0ut). Rachael Hite: You have to choose your battles and find a tech plan that works for your lifestyle. No one wants to be left behind, but you have to choose your battles and find a tech plan that works for your lifestyle. Technology can be a positive bridge between consumers and agents. The challenge is finding a user-friendly experience for both parties. Mobile technology will make it easier for us to connect, but it has to be neutral and factual. This is why the new RPR app is awesomesauce! Use it! The rise of technology and the availability of information has benefited the consumer. I think transparency and information makes our industry better as a whole. Gmail! It works! It’s easy to use and very mobile-friendly. Combine it with the Yesware add-on and it is a powerhouse for dealing with clients. I’m going to be honest. I have tried too many CRMs and I’m not happy with any one of them enough to endorse them in anyway. The only platform I’m advocating for at this moment is postable.com because I love the mini database. Currently I’m using Sunrise with my Google calendar. I was having trouble reading my Google calendar app on my phone (which is ridiculous because my phone is huge). Sunrise is easy to read and I am finding that it is easier to schedule clients with. Do you use digital documents, which ones? My digital life exists in Google Drive. It is easy to use, and their product suite is functional. I have everything in once place and I can pick up any of my gadgets and keep working. Currently, I use a Sony Alpha NEX-5T. It is lightweight and user-friendly, and takes beautiful pictures and video. I still have my Nikon D40 SLR camera that I bought the year my son was born (2007) that I pull out when I feel like playing “photographer.” It’s a workhorse and has taken a ton of abuse! For everyday photos, my S5 takes great pictures. I have an Acer Chromebook that I love. It boots up in seven seconds, the resolution is gorgeous and it is very comfortable to write on. Since the Chromebook has entered my life, it has become my favorite device. Word of caution: Not everything is Chromebook-friendly yet. I play games with my kiddo on his Wii. My devices are for work, not play. I’m too busy to “Candy Crush” my life away. YouTube, Hootsuite, Canva and Facebook. YouTube is how I start my day. While I’m making breakfast and getting dressed, I can watch short videos and TED talks to get pumped for the day. Again, most of my work is online, and these are the sites I use to learn, grow and manage work. I’m still primarily on Facebook and Twitter. I’m having difficulty finding Snapchat people! Snapchat me! User name: rachaelbhite. Apple Watch for me … for work, more video equipment. I really enjoy making videos! I hung up my license over a year ago, but when I was working I utilized ZTR, Facebook and personal client referrals. Social media. I enjoy making meaningful connections. How awesome is it that I can chat content development strategies with someone from across the world on Twitter? It is amazing! Social media allows me to travel and chat anywhere I want to go. I have the world in my hand. What is your favorite “unplugged” activity? I’m a huge bookworm. I’m not sure if reading on my Kindle Paperwhite counts as unplugged … but I read every night before bed. If you are a voracious reader such as myself, you need a Kindle to save you from overdue library fees and bankrupting yourself at the bookstore. I also enjoy art, yoga and hiking outdoors with my dog. My lifestyle is really hectic. I really treasure reading to my son, spending quality time with my family and stealing a few quiet moments for myself. Are you a tech user who’d like to participate in our profile? Email amber@inman.com.